Echoing the opening notes of Si Eau de Parfum, the fragrance opens with notes of blackcurrant essence. Its captivating nectar is enhanced by bergamot essence like a luminous ode to the Italy of Giorgio Armani. The delicately blended heart notes of frankincense and jasmine absolute are softened by fruity velvety accents of osmanthus absolute. The amber accord intensifies with the unforgettable vanilla and patchouli essence, that wraps the skin in a radiant warmth. Made in the highest perfume concentration with 25% essential oils, say Sì to passion, power and sophistication. 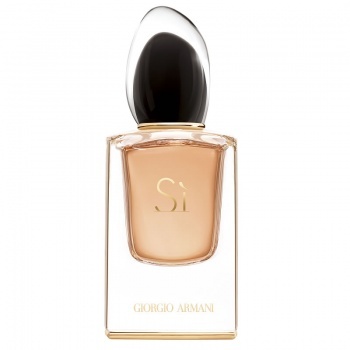 Giorgio Armani's tribute to modern femininity, an irresistible combination of grace, strength and independent spirit.